The Vikings closed out the preseason during a matchup with the Dallas Cowboys. This was the final tune-up for the starters and the Vikings cruised to a 28-14 victory. Daniel House provides you with all the notes from tonight's win over the Cowboys. The Vikings closed out the preseason during a matchup with the Dallas Cowboys. This was the final tune-up for the starters as the fourth preseason game will be a roster battle contest for fringe players. The Vikings struck first on a 28-yard field goal from Blair Walsh, but the Cowboys quickly made an offensive spark. Robert Blanton and Harrison Smith took poor angles and Terrance Williams beat them across the middle for a 60-yard touchdown reception. Special teams made an impact and Cordarrelle Patterson used excellent blocking to fuel a 107-yard kickoff return touchdown. Dallas struck back with a 8-yard touchdown strike from Tony Romo to receiver Lucky Whitehead. This score came against a cast of second team defensive players. Vikings kicker Blair Walsh added a 45-yard field goal to close out the first half and narrowed the halftime gap for Minnesota. In the second half, Dominique Williams plunged into the end zone for a three-yard touchdown and Taylor Heinicke completed a two point conversion try to Chase Ford. 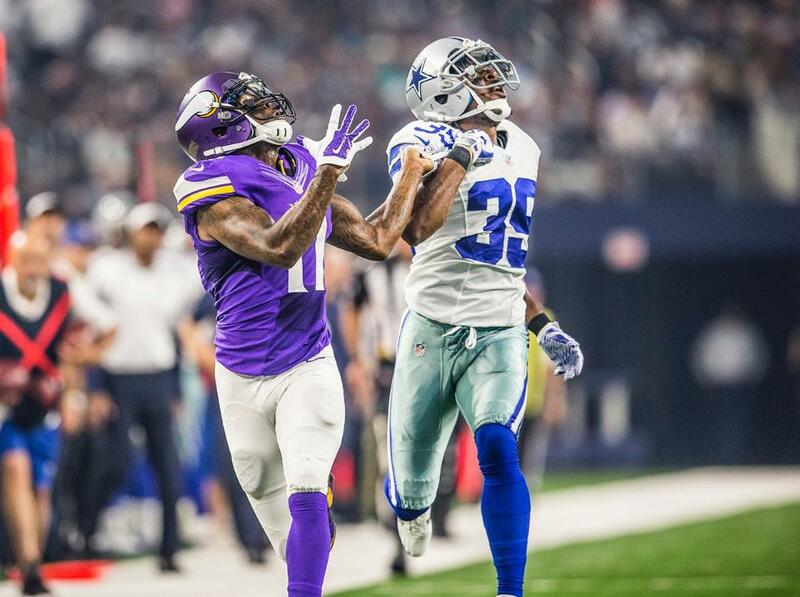 The Vikings closed the fourth quarter with a 7-yard touchdown run by Joe Banyard and that's all they needed as they cruised to a 28-14 victory over the Dallas Cowboys. Teddy Bridgwater has had no problems in the preseason with accuracy or efficiency. Tonight, he completed all seven of his pass attempts for 76 total yards. The highlight of the night from the first team offense came on a 35-yard reception from Bridgewater to Mike Wallace. Wallace got open on a fade route and Bridgewater perfectly placed the pass over the top of the defense. It was the first time we've seen Teddy stretch the field with his new target. Bridgewater has total command of this team and has completed over 80% of his passes in the preseason. Tonight was his final tuneup before the regular season begins on September 14th. Bridgewater certainly has thrown the ball around to several different targets and is utilizing all of his offensive weapons. Taylor Heinicke saw extended action in the second half and easily played his best game in a Minnesota Vikings uniform. He looked comfortable in the pocket and was elusive enough to make plays up the field. Tonight, he was 11-for-11 with 83 yards passing. He threw several passes with tight spirals and really made some excellent decisions. The Vikings will need to decide whether they can save a place for him on the roster as the third quarterback, or if they can slide him onto the practice squad. The running backs really couldn't move the ball at all against the Cowboys front-seven. Jerick McKinnon and Matt Asiata combined for just nine carries and 12 yards on the ground. This has been a reoccurring theme for the Vikings' running game. In early contests, it has been a mixture of offensive play and indecisive decision-making by the running backs. Tonight was much of the same. However, the reserves were moving the ball relatively well on the Cowboys defense. Dominique Williams rushed for 25 yards on six carries and added three receptions for 30 yards through the air. He used patience, vision, and smooth cutbacks to run the ball very well. He added a four-yard touchdown in the third quarter. Williams will have a steep hill to climb with this team, but he certainly has showcased his talents this preseason. Everyone can relax -- Mike Wallace caught a pass! He hauled in a long 35-yard reception from Teddy Bridgewater in the first quarter and added two more catches for 15 yards. He was the leading receiver tonight and was heavily involved in the offensive flow. Wallace was relatively quiet in the early stages of the preseason, so it was encouraging to see him perform well in the final tuneup for the offense. Wallace has used his veteran leadership to be a major advocate for younger players on this roster. It has definitely rubbed off on rookie Stefon Diggs. He also had three catches for 49 yards, including a 20-yard reception from Taylor Heinicke. Diggs got open and was featured more in the system this week. When the regular season rolls around, it will be very interesting to see how much he is used in the offensive gameplan. The offensive line held their blocks relatively well, but the Cowboys defense front was getting a solid push during certain portions of the game. It really effected interior runs between the tackles. Without watching extensive tape yet, it's hard to know who is at fault. Zac Kerin and Joe Berger both laid some nice blocks in the second level, but they both resulted in minimal gains. From a pass blocking standpoint, the Vikings allowed two total sacks tonight. Cowboys defensive end Randy Gregory used effort to gain a sack, where he broke away from initiation with Matt Kalil. As a whole, the first team offensive line held up well. Clemmings might have missed an assignment on one pass rush, but he didn't allow it to result in a sack. Sharrif Floyd was dominating the line of scrimmage during the early portion of the game. In fact, (for the most part) the Vikings starting front-seven had the edge against the Cowboys offensive line. Floyd provided interior pressure that resulted in a tackle for loss. He also was at the hands of an interior disruption that caused Tony Romo to throw the ball away on third down. Floyd was being disruptive in not just run defense, but as a pass rusher, as well. Those are both aspects he will need to provide every week. Danielle Hunter notched his first sack of the preseason and came across the line of scrimmage to sack Cowboys quarterback Dustin Vaughn. He looked more comfortable in the pass rush and is showing flashes of improvement each week. If he can develop more moves and handle the finesse of offensive lineman, he can be a rotational threat for the defensive line. Eric Kendricks is making a strong case to see an extensive amount of playing time in this defense. He corralled four total tackles and was causing havoc as a run defender. Kendricks made a phenomenal shoe-string tackle and stopped a screen pass dead in it's tracks. He is a solid tackler that has incredible closing speed for a player with his size. Kendricks has the instinct to cause consistent disruptions for this defense. Anthony Barr had just one tackle, but seemed more comfortable on the field. He was more involved in both run defense and coverage. His conditioning seems to be the biggest obstacle, but that will slowly improve as the regular season approaches. Xavier Rhodes shut the door on a pass intended for Lucky Whitehead. He perfectly used physicality and ball skills to knock away the pass. Rhodes has consistently used his footwork and superior technique to his advantage this preseason. Teams will have a tough time throwing passes in his direction. Captain Munnerlyn started his first game at nickel cornerback and had his share of good and bad moments. Munnerlyn was called for defensive holding, but made a solid tackle as a run defender and nicely blanketed a pass in coverage. Trae Waynes wasn't targeted much, but knocked away two passes. He prevented a completion on a fade and stopped another throw towards the sidelines. Waynes is showing growth, but wasn't tested nearly as much tonight. Cowboys quarterback Tony Romo completed a 60-yard touchdown to Terrance Williams on a post across the middle. Safeties Robert Blanton and Harrison Smith both were biting hard on the play action and took poor angles on the pass to Williams. He split the defense and ran up the sideline for the first passing touchdown the Vikings had surrendered in the preseason. Andrew Sendejo also knocked away a pass on a crossing route intended for Gavin Escobar. He perfectly positioned himself and made the physical play. Kicker Blair Walsh made all of his extra point tries, but went 2-for-3 on field goals tonight. He missed from 43-yards out and pushed the kick hard. He has struggled with consistency recently and the work he did this week in practice still wasn't enough to give him a full confidence boost. Jeff Locke got his right ankle rolled up on. He left the game, but returned for the remainder of the contest. Blair Walsh punted once for Locke and boomed a 50-yard kick in his absence. The highlight of the night from the special teams group was a 107-yard kickoff return touchdown by Cordarrelle Patterson. The play was blocked extremely well and was sprung by an excellent Matt Asiata block. Patterson made a phenomenal move on the kicker and easily took the kick all the way back for touchdown.